Unicorp has been chosen to begin demolition on the 5th floor of the Landmark Building. The Lanmark Building is slated to be a mixed use building in the heart of downtown Jackson, Mississippi. Demoition will begin immediately and is scheduled to wrap up in August. The Byram Corner Development project is new construction and will involve site development, concrete foundations, aluminum canopies, mechanical, plumbing and electrical. The 8,250 square foot building will have an exterior skin of stucco and brick with storefront and will house 3 tenants with the larger side being a restaurant. The building is located at the corner of Siwell and Terry roads in Byram, MS and is expected to be complete in October 2018. Unicorp has begun demolition for the renovations and alterations to The Quarter on Lakeland Drive in Jackson, MS. The Quarter is one of the Jackson area’s first mixed-use complexes and the planned enhancements will add 12 luxury apartments to the already eclectic mix of office, retail, and living spaces. The project includes full interior demolition of buildings A, B, C, D, E. These are the north facing buildings visible from Lakeland Drive and will involve what is currently upstairs office spaces being converted to luxury apartments. Once demolition is complete, framing, drywall, flooring will be added as well as new cabinets, appliances, granite countertops, paint, new interior doors, plumbing and HVAC. There will also be exterior improvements as well as the Wine & Spirits Shop will be expanding, the Country Squire will be moving to a new space and Cup’s will remain in it’s current location. The project is expected to wrap up in September. The second phase of the Carroll House Apartments project is underway. The projects that make up Carroll House are located in Green Forest (13,925 sq. ft.), Berryville (20,418 sq. ft.) and Eureka Springs (20,416 sq. ft.), all located in Arkansas. The projects involve the renovation of existing apartment buildings with new roofing, gutters and downspouts, windows, stairs and landings, repairs and replacement to siding, new flooring, paint, and cabinets. Amenities include a new clubhouse in Berryville and clubhouse renovations and additions in Green Forest and Eureka Springs, postal building, covered bus stops and gazebos. The project is expected to wrap up in July, 2018. 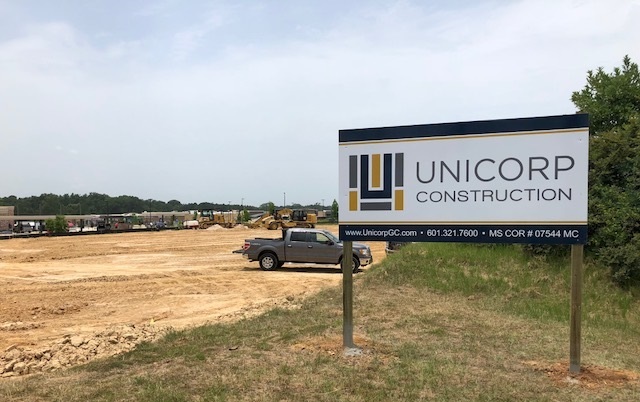 Unicorp has begun construction on Palisades Park Townhomes in Laurel, MS. The project consists of new construction to provide 32 (wood framed one story) townhouse residences. Each residence will include a 2-vehicle garage and are designed to meet NGBS Silver Performance Level. Amenities included neighborhood services, exterior security, walking/jogging or biking trail, and landscaped area including a gazebo with sitting area playground and a volleyball court. Also included will be a clubhouse with a fitness center and business office. The total site area is approximately 7.8 acres, and the total built area is approximately 58,242 sqft. Scope of work is but not limited to, selective site demolition, cast in place concrete, stone masonry veneer, architectural woodwork, fiberglass shingle roofing, fiber cement siding, resilient flooring, carpeting, residential appliances, plumbing, HVAC, earthwork, asphalt paving and a segmented retaining wall. Construction for the project is scheduled to wrap up in December, 2018. 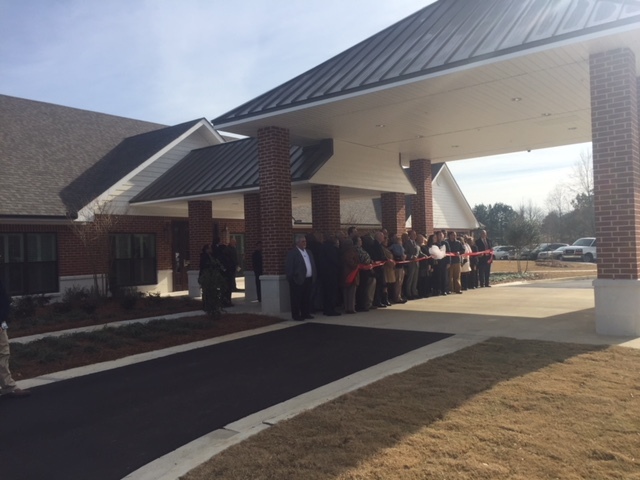 Unicorp was recently awarded an addition to the Madison Heights Church on Bozeman Road in Madison, MS. The new construction project consists of a 3,430 square foot open air breezeway, a two Story 5,420 square foot addition, one story 3,950 square foot addition, and renovation of 1,450 square foot space in the existing two-story building. The project scope includes demolition, cedar arches that will match existing arches, site development, concrete work, masonry, structural steel, rough carpentry, millwork, modified bituminous roof with rigid tapered insulation, standing seam roof, stucco, new doors and storefront, metal stud framing and drywall, acoustical ceilings, hard tile, tile, carpet, painting and wall covering as well as new plumbing and HVAC. 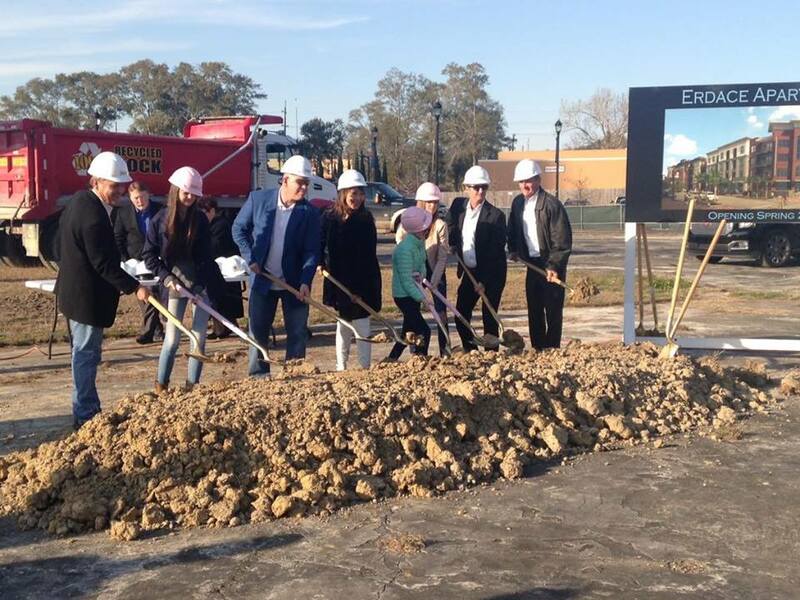 Unicorp Construction has been chosen as the General Contractor to build the Class-A apartment community The Retreat at Fairhope Village located on Highway 98 in Fairhope, AL. The 240-unit property is located on Fly Creek Avenue and will feature upscale amenities, ample natural green space, and walking trails. “We’re excited to bring a first-class housing option that supports Fairhope’s vision of the walkable village concept,” said Stewart Speed, president of Leaf River Group and developer of The Retreat at Fairhope Village. “Our goal is to meet the housing needs of those who’ve decided to move to the area while keeping with the craftsman-style architecture that is seen throughout the city.” Some of the most stringent and comprehensive environmental protection techniques are being required for the site and Fly Creek. This includes phased construction installation of storm water best management practices and an environmental impact. The Retreat at Fairhope Village will feature a clubhouse with gourmet kitchen, coffee bar, fitness facility with yoga room, resort-style saltwater pool, outdoor fireplace and grilling area, community walking trails, reading library, dog washing station, and bike racks. The residences will feature 9-10’ ceilings, garden tubs, walk-in closets, stainless steel appliances, tile backsplashes, and patios/balconies. Unicorp has been selected to be the General Contractor for the renovations to Golden Key Apartments in Jackson, MS. Golden Key Apartments provide affordable, independent-living for senior citizens, mobility impaired persons and persons with disabilities. The fully renovated complex will provide 152 one-bedroom units including 8 accessible units and 4 units with accessible communications features. The complex includes three, three-story apartment buildings surrounding a secured parking lot and an adjacent community building, which includes a library. Each apartment building contains an elevator, laundry and mail facilities. The adjacent Golden Key Activities Center, which includes the Fannie Lou Hamer Library, will be renovated as well. The community library will continue to function along with a large community room, business education center, dining/meeting room and ceramics/craft room. All of the spaces and services of the library/community building will be available for Golden Key residents to utilize. Walkways connect all of the apartment buildings and connect the apartments to the community building. A loop walkway creates a half-mile walking trail around the site, and connects residents to a community garden and outdoor gathering pavilion. 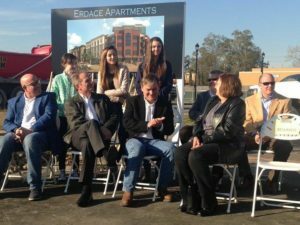 After many years of planning the developers of Erdace Apartments held a groundbreaking ceremony in the heart of downtown Lake Charles, LA. The project is valued at over $40,000,000 and is the largest downtown investment in the history of Lake Charles. Erdace is a 4-story building featuring 270 luxury studio, 1 and 2 bedroom apartments. The units feature 10-foot ceilings, private balconies in every unit, washer and dryer, granite countertops, hardwood flooring, walk in showers with garden size tub, track lights and ceiling fans. 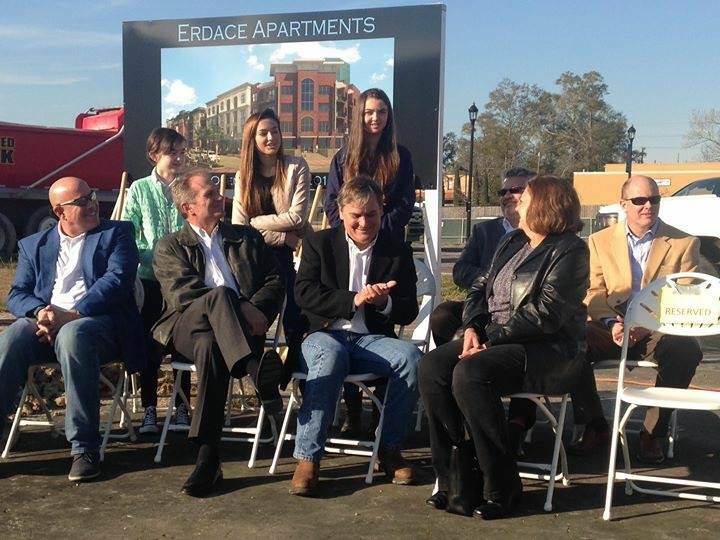 Erdace offers downtown living with interior entry for every unit. Amenities include a 4,500-square foot fitness facility, a yoga room, landscaped courtyard with a massive swimming pool, fountain areas with gas grills, parking garage and a separate conference/business center for residents. Unicorp Construction, is the General Contractor for the project. Erdace has a 15-month construction schedule with an opening planned for Spring of 2018. A ribbon cutting ceremony was held in January for the Edgewood Health and Rehabilitation Center, a 58,400 sf 80 unit, 119 bed facility located in Byram, MS. The project has a slab-on-grade foundation with wood frame panelized walls. The exterior has burnished lime stone and brick with a Porte Cohere drive thru entrance, architectural shingles and standing seam metal roof. The building features a full commercial kitchen with a spacious dining area and a memory care unit. Unicorp Construction was the General Contractor. Unicorp Begins Work For Vicksburg Housing Authority. Unicorp Construction began demolition on the Vicksburg Housing Authority project on Dec. 6 with starting with 34 units at the housing authority’s Hayes Street property followed by Urban Court which began in February. The work is part of a 15-phase, $50 million program to renovate and upgrade all of Vicksburg Housing Authority’s 430 housing units as the housing authority converts its properties from public housing to Section 8 under the U.S. Department of Housing and Urban Development’s Rental Assistance Demonstration Program. This program requires the housing to be brought up to HUD standards. Funding for the project included low income tax credit financing, historic tax credits on the property, funding from the Federal Home Loan Bank, money from the Mississippi Home Corp. Housing Trust Fund and $2.4 million in capital improvements money VHA kept in as reserve in anticipation of being part of the RAD. The renovations include new roof shingles, vinyl tile flooring, raised panel doors, three paint colors on the interiors, cabinets with granite counter tops, stainless steel appliances, nickel plated handles and fixtures, new air conditioning with new thermostats, repairs to sheetrock, ceramic tile and enamel coating on the tubs, windows, new doors and screen doors, new wall outlets and covers.